Two varieties of laser treatment are available for cosmetic enhancement: ablative and non-ablative. Traditional ablative lasers, which literally means vaporization at a very high temperature, are often effective at destroying unwanted tissue, but may have significant side effects and requires a lengthy healing period. One of the premier non-ablative fractional lasers for skin resurfacing is the Palomar™LUX 1540. Since the Lux 1540 delivers fractionated light the treatments are safer, produce consistent results, and typically have minimal healing time. Fractional skin resurfacing with the LUX 1540 is much less invasive compared to ablative laser procedures, resulting in less risk and quicker improvement in a multitude of skin flaws. It’s the skin resurfacing solution that can give you youthful, touchable, and beautiful skin from head to toe. Laser skin resurfacing can help those who want to improve the appearance of fine lines and wrinkles, acne scarring, scar improvement, brown spots and hyper pigmentation, melasma, skin tightening, and overall skin quality. The natural aging process, combined with exposure to sun and pollution, destroys collagen — the main protein of connective tissue that keeps skin plump and line-free. Laser resurfacing uses beamlets of energy light to bore tiny holes in the skin, which works to put the body’s natural collagen production on fast-forward, but without much downtime. It rejuvenates the skin from the inside out, smoothing the appearance of wrinkles, scars, pigment, and other problems. Usually you may resume your regular activities the same day following some treatments; more aggressive procedures may require several days of healing. Most people notice positive changes in skin tone and texture within a few weeks. A series of 3-5 treatments at 3-4 week intervals may be required to achieve the desired results. Can The LUX 1540 be used to treat Dark skin types? Yes, due to the 1540 nm wavelength of the laser, the Lux 1540 can be used to safely treat patients with darker skin. 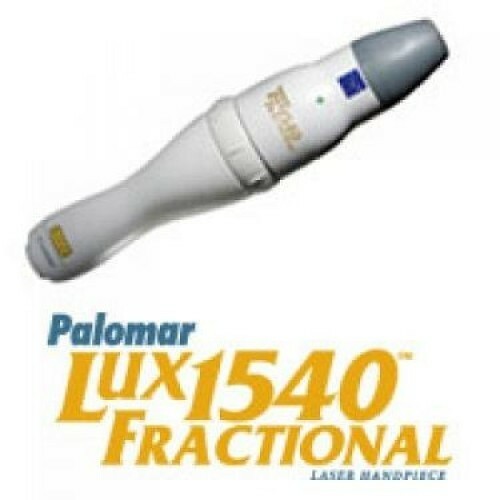 In February 2010, the Palomar StarLux 1540 (now called the Lux 1540) non-ablative fractional laser handpiece received the first clearance by the U.S. FDA for the treatment of striae (stretch marks) using a fractional laser. Stretch marks are extremely common, found in 90% of pregnant women and 70% of adolescent females. The Lux 1540 treats stretch marks by causing collagen shrinkage and tightening the skin. Typically 5 – 6 treatments are recommended for stretch mark improvement.